College football is just around the corner -- we’re exactly six weeks away from the Gophers’ season opener against New Mexico State on Aug. 30. So, with that in mind, I’ll take a look at Minnesota’s 12 opponents by asking five questions to a writer covering that team. Today’s installment is Game 2, Fresno State. 2017 record: 10-4, 7-1 Mountain West; lost 17-14 to Boise State in MWC title game; defeated Houston 33-27 in Hawaii Bowl. 1. Fresno State went from 1-11 to 10-4 in Jeff Tedford’s first year as coach and played in the Mountain West championship game. What was the key to the quick turnaround? The easy answer is consistency of coaching, but there are a lot of factors that play into that. The players, I think, were ready for a change, a new direction and voice. That 1-11 came at the bottom of a consistent slide from 6-8 to 3-9 to 1-11. Their discipline and aptitude also were big, particularly with the turnaround on the defensive side of the ball, where allowed 320.6 ypg and 17.9 ppg from 415.1 and 30.9. There was some talent and some football players in the program. But the consistency of Jeff Tedford and that staff, that really was it. The accountability. The teaching. The confidence. The game planning. All of that was critical to 10-4. 2. Quarterback Marcus McMaryion quickly earned the starting job last year after transferring from Oregon State. What do you see as his potential in his second year as starter? The thing about McMaryion, he didn't step foot on the practice field until after the first scrimmage in fall camp. He was in a catch-up mode all season. He would get a game plan and try to execute it. But the ‘why this?’ and ‘why that?’ and ‘what do I do if this or that happens?’ he didn't always have those answers. He also had to learn his receivers, how they run routes, how they come out of breaks, where you can and can't throw it. His first pick -- and he only threw five of them in 351 attempts -- happened because the receiver cut off a route and he was not at that point in the season able to anticipate it. He didn't have a great base in the offense. With a spring practice, a summer and a full fall camp, the expectation is he will have a better grasp of the offense and be much more adept at operating it. That should show in limiting mistakes and greater production in different parts of the field. 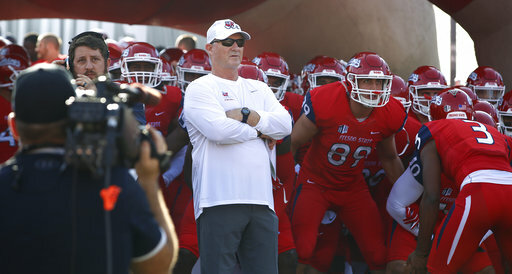 Fresno State, for instance, was not a good third-down team last season (35.6 percent conversions, eighth in the league) and struggled in the red zone (54.7 touchdown percentage, eighth). 3. The Bulldogs defense returns seven starters but none on the defensive line. How big of a concern is that for the coaching staff? That is a concern and it will be a big one on Sept. 8, given their history against Power Five programs. That's not pretty -- they've lost their past nine games and seven of them have come by 30 or more points, though they have played some good teams. There is a physical gap there for just about every Group of Five program. The No. 1s along the defensive line entering fall camp all got reps last season but will be making a significant jump to 40 or 50 snaps a game from 10 or 15, so there are a lot of questions to be answered. I haven't looked much at Minnesota yet, but it’s going to have to get some quarterback play and I do know that is a big question there. Fresno State did a really nice job last season attacking quarterbacks and forcing mistakes. They'll give a lot of looks and don't figure to give Minnesota a lot of clues what it might see in an opener against Idaho. If they can force some turnovers and get some quick three-and-outs, I can see them winning.